Last week I published the results of an analysis that focused on ambassadors who are active on twitter in addition to their embassy. My results indicated that some ambassadors add to their embassy’s digital diplomacy impact by publishing engaging content. This week I decided to further my analysis of tweeting ambassadors and investigate whether or not ambassadors use twitter in order to foster dialogue and engage in conversations with their followers. In order to do so, I used a sample of nine ambassadors to the US that are active on twitter. These include the French, Italian, Qatari, Israeli, EU, UK, German, Norwegian and Swedish ambassadors to the US. The first parameter I evaluated was level of activity in terms of number of tweets published by each ambassador over a two months period. This parameter is important as activity attracts followers and followers may, may in turn, seek engagement with ambassadors. 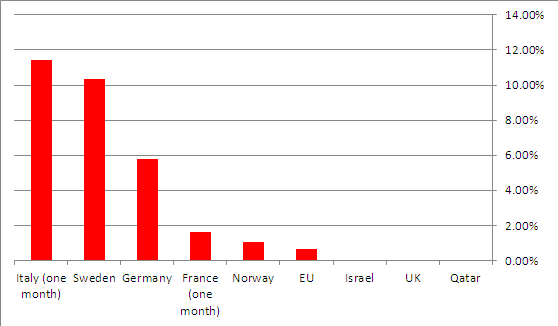 The graph below details the number of tweets published by the ambassadors in my sample during the months of June and July 2015 (note: given their scope of activity, the data collected on the Italian and French ambassador spanned only one month, July 2015). As can be seen, the volume of activity varies greatly between ambassadors. While the French ambassador published some 900 tweets during July alone, the British ambassador published only 54 tweets. However, the average ambassador published more than 260 tweets during the sampling period demonstrating a rather high volume of activity. The second parameter I evaluated was the extent to which ambassadors create their own content on twitter. Ambassadors who simply re-tweet content published by their embassy are less likely to attract social media followers. This is due to the fact that twitter users follow ambassadors given a desire to gain insight and knowledge through the ambassador’s unique perspective. Moreover, when ambassadors share insight with their followers they are more likely to stimulate online debate. The graph below details the percentage of embassy tweets re-distributed by ambassadors out of the total number of tweets they published during the sampling period. As can be seen, the majority of ambassadors rarely re-tweet content published by their embassy and such re-tweets account for less than 6% of all content published by ambassadors over the sampling period. 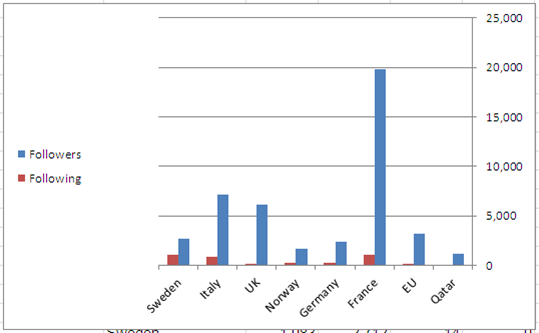 In fact, embassy re-tweets account for 3.86% of all tweets published by the average ambassador in this sample with the exceptions being the Italian and Swedish ambassador. Thus, it seems that the ambassadors in this sample are quite active on twitter and do not rely heavily on tweets published by their own embassies. By authoring their own content, ambassadors may be able to attract large numbers of followers to their accounts. Yet the important question is- what happens once followers flock to an ambassador’s twitter channel? Does the ambassador use this medium in order to engage in conversations and dialogue with a global public sphere, or does he simply use twitter in order to broadcast information at these followers. True dialogue is comprised of two elements- listening and engagement. Therefore, in order to assess whether ambassadors speak at us, or with us, I compared the number of followers each ambassador attracts with the number of SNS users the ambassador follows. 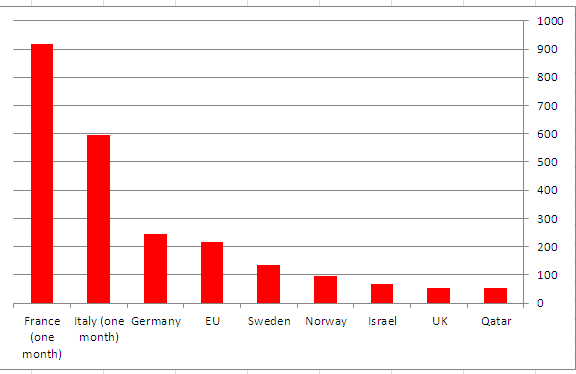 This analysis can be seen in the able below (note: Israel’s ambassador was removed in order to include all other data in one graph). As can be seen, there is a sizable gap between an ambassadors number followers and the number of users he follows himself. In the case of Israel’s ambassador to the US, this gap is a chasm as Ambassador Dermer has 47,476 followers on twitter while he himself follows a mere 170 twitter users. This gap between followers and following may suggest that like MFAs and embassies, ambassadors on twitter are more interested in talking than in listening to the online public. This assertion is furthered by the final parameter employed in my analysis- occurrences of engagement between ambassadors and their online followers. Engagement was defined as instances in which ambassadors communicate directly with their followers (e.g., answer questions, respond to criticism, reply to tweets directed at them). The graph below details occurrences of such engagement during the sampling period. As can be seen, five of the nine ambassadors evaluated did not engage at all with their followers during the study sample. 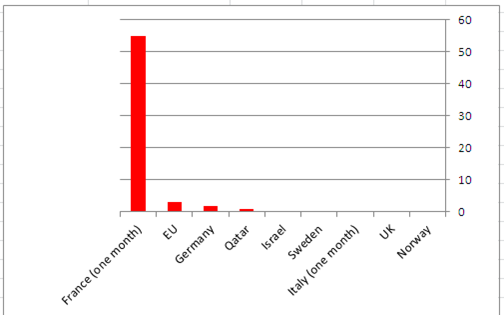 In addition, the German, Qatari and EU ambassadors to the US rarely engage with their followers and such engagement represents a minute fraction of their overall activity on twitter. It should be noted, that on the 1st of June both the Swedish and Norwegian ambassadors engaged in dialogue with followers yet this was part of an organized Q&A on arctic issues. As such it was excluded from the sample. 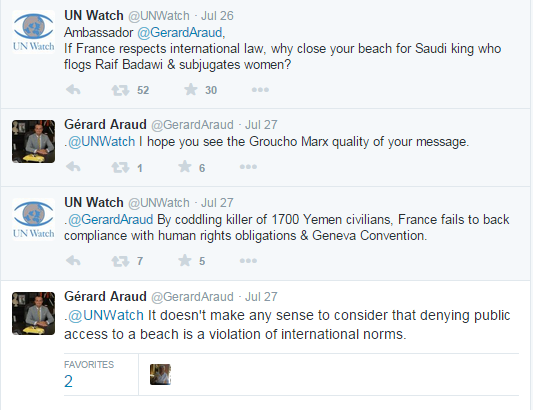 The exception to the lack of overall engagement is the French ambassador to the US, Gérard Araud (@GerardAraud). During a one month period, Araud frequently engaged in conversations and even debates with his followers on a wide range of issue spanning from the Iran Deal to a possible “Grexit”. It is Araud’s use of twitter to foster dialogue with his followers that illustrates this medium’s potential for all diplomats and diplomatic institutions. 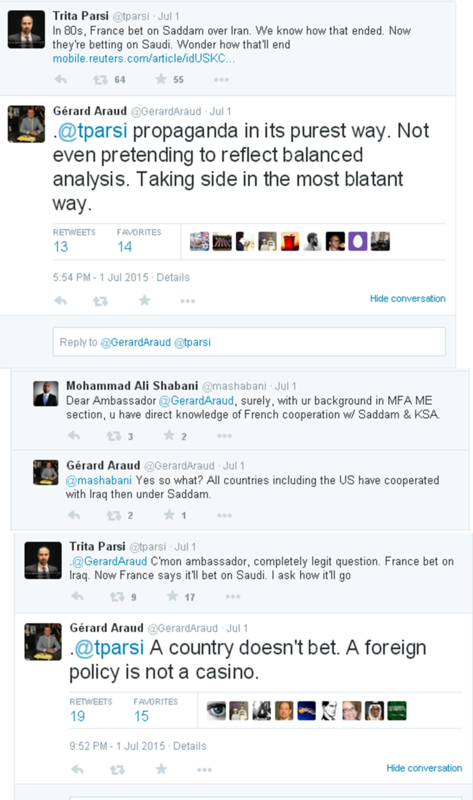 For instance, in the example below Araud and a follower exchange opinion on France’s one time support of Iraqi dictator Saddam Hussein. Rather than shay away from confrontation, the French ambassador seems eager to engage with critics of France thereby presenting his nations’ foreign policy, past and present, in a coherent manner. In the second example, seen below, the Ambassador again engages with critics of his nation over the issue of human rights and international law. Araud’s willingness to partake in dialogue with critics is quite uncommon among diplomats on twitter who usually fear losing control of their message and being exposed to “trolling”. 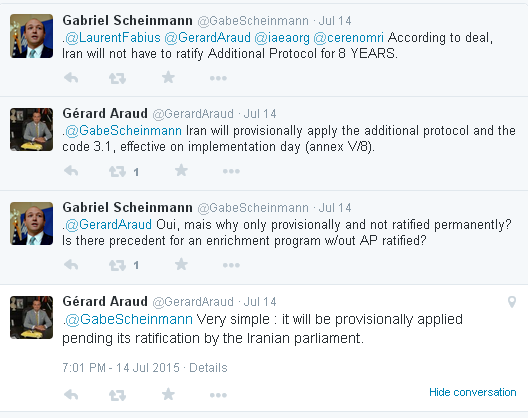 Finally, in the third example seen below Araud engages in dialogue with a follower over the follower’s interpretation of the Iran nuclear agreement. This is but one segment of a much longer discussion between the two which illustrates the scope of dialogue the ambassador is willing to engage in. In summary, it seems that ambassadors in this sample are able to attract numerous followers to their twitter channels given high levels of activity and authorship of their own, unique, content. Yet when it comes to dialogue and engagement, these ambassadors also fall short demonstrating yet again that the potential of digital diplomacy has yet to be realized and that the road between digital diplomacy and diplomacy 2.0 remains long and winding. Posted in Uncategorized and tagged Ambassador, dialogue, Digital Diplomacy, diplomacy 2.0, engagement, online engagement, twiplomacy, twiter. Bookmark the permalink.